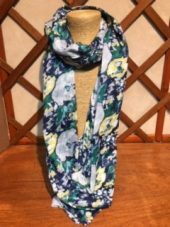 This beautiful Large Floral Scarf from Tulchan is a stunning addition to any wardrobe. It is available in the colour Blue Velvet and is very soft, so drapes well. The print design is unique to Tulchan.